Welcome to Flagdom - We are the largest factory direct importer of swooper feather flags, wind-free feather flags, feather flag hardware, and car window flags on the east coast of the United States. We also carry thousands of stock flags including American flags, historical flags, military flags, international flags, nautical flags, racing flags, state flags, and religious flags available for immediate shipment at discount pricing. We also specialize in producing custom flags including custom feather flags, custom 3x5 flags, and custom printed banners. 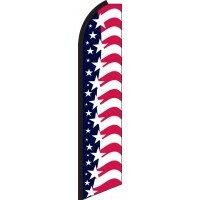 We stock all popular sizes of American Flags which are manufactured to our exacting specifications in the United States. All of our USA flags are made with embroidered stars and sewn stripes from the finest quality nylon, polyester, and cotton materials. Polyester flags are perfect for those individuals searching for the highest quality and longest lasting materials available. Nylon American flags are ideal for customers looking for a balance of value, flyability, and quality. Cotton American flags are designed for those looking for the most authentic look.